Taking a break from all things soft and stitchy, I wanted to show you what I got in the mail recently from my sister. 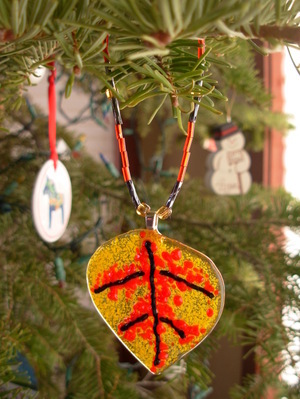 She is a talented glass artist as well as stitcher. 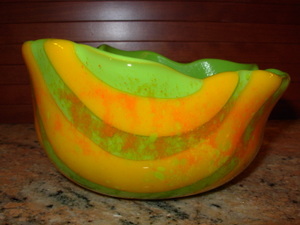 For my birthday I got this beautiful bowl which I love for the colors and the sweet shape. Thank you so much, Cheryl! A couple of weeks later we got a Christmas package from Cheryl. Inside was one package that said, "Open Now". 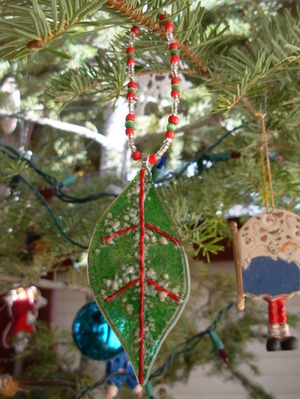 So we did and we were thrilled to see these beautiful glass leaf ornaments, one for each of us. She even made some fancy doggy cookies for Scrabble. What a sweetie! Aren't they breathtaking! Me thinks my sister needs a blog! Ryan got a special birthday present from my sister this week. 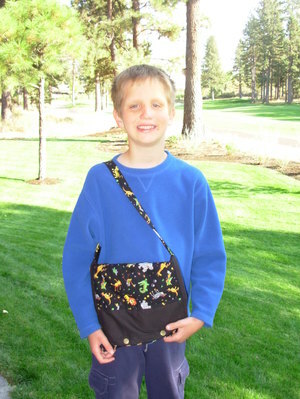 She made him this little tote to carry matchbox cars. How cute is it? Ryan loves the fabric and the cars that came with it. Thanks, Cheryl! I finally got my final One Skein Secret Pal package. I had completely forgot it was coming, so it was a big surprise! My SP is Anna in Texas. Thank you, Anna! 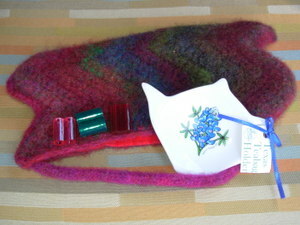 She made a lovely little crocheted and felted clutch and included several other little goodies, including a new skein of yarn. What a treat! 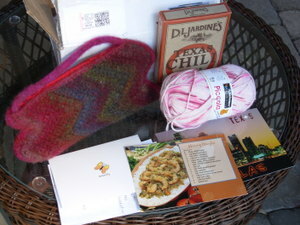 I got a lovely note, some postcards, a Texas Chili mix, and this super cute skein of pink yarn. Not only that, inside the clutch came point protectors and a tea bag holder. Anna, this clutch is especially cool because this is the very same yarn that I'm using for my super secret project. I love it! I would love to send a private email to you, Anna, but I can't find your email anywhere. Please leave a comment or email me and I'll be in touch. This has been a busy week with Chloe's summer conservatory wrapping up. I'll have more about that tomorrow. Today it's all about the latest random creations. First, this is the parts department. 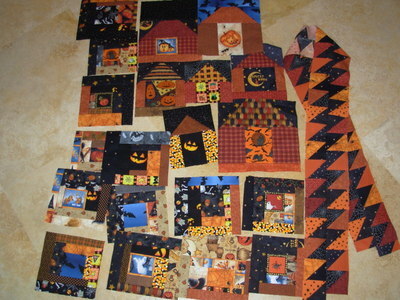 I'm taking a cue from Gwen and Freddy and creating my own parts for a Halloween quilt. I'd love to have this top done before mid-August because I'll be leaving for a lengthy trip then, but time's getting short. This kind of quilting is so much fun. 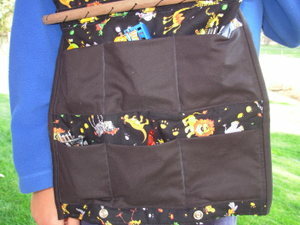 I've got tons of Halloween fabrics and I'm having a great time using scraps. 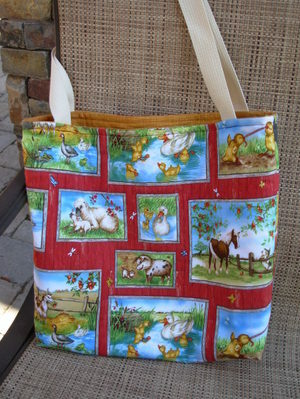 I also finished this big quilted tote for a silent auction at an upcoming homeschooing conference. The idea of the silent auction is to have "passion baskets" where someone fills a container with the tools and materials for whatever passion they would like to share. In our case I'm going to fill it with a bunch of picture books and story tapes that we are ready to pass down and call it "A passion for stories". It's made from two fat quarters and I followed the directions at this tutorial, with an added layer of batting machine quilted to the outer fabric. I finished my first Summer of Socks pair. 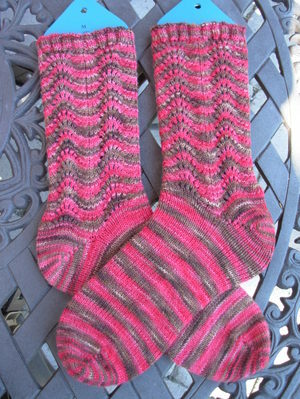 These are the chocolate cherry colorway of Claudia Handpainted Sock yarn. This yarn is fabulous! 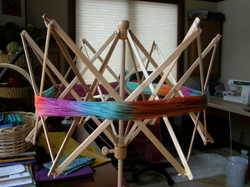 I would use it for a shawl someday. I worked these two at a time on two circulars and I'm definitely a convert. I love having them done at the same time! 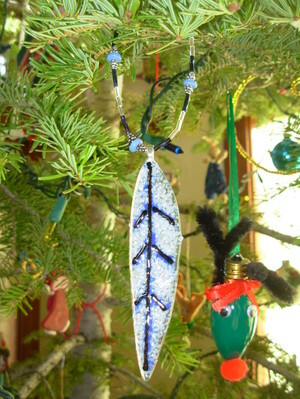 The pattern is Wendy's toe up feather and fan with a change at the top. I didn't like the way the garter stitch edge was spreading out, so I did a ribbed cuff and finished with the sewn bind-off from Elizabeth Zimmermann's Knitting without Tears. These will be entered in the Deschutes County Fair this weekend. 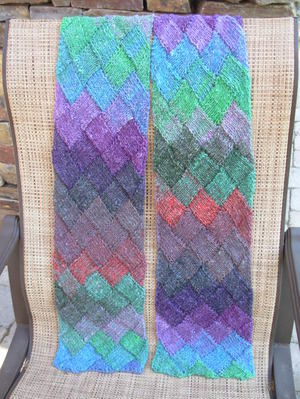 I also finished the Entrelac Scarf from Scarf Style (it's called the Lady Eleanor Stole). This was a wonderful knit and I would do this technique again especially with these very well written instructions. I decided not to do the fringe on the edge for now. I got two wonderful yarny packages in the mail this week. 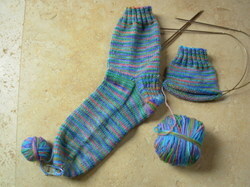 The first was from the Rockin' Sock Club. 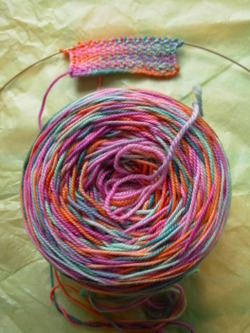 This beautiful skein of lightweight Socks that Rock in a new colorway called Peaseblossom. I love this! The pattern looks interesting. So far I've not done any of the patterns that came with the yarn, but I think I'll try this. Maybe I'll just modify it for a toe up version. I also got my July package from my One Skein Secret Pal. This yarn is Jaggerspun Zephyr! Wow, wow, wow!!!! I'm so thankful, SP! I've been wanting to try this yarn, but haven't seen it on any of my travels. 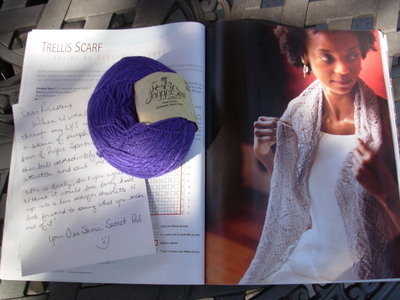 It's the most beautiful purple for July's Project Spectrum- how neat is that! The color is not showing true on my monitor though I tried the photo in three different places. You'll have to trust that it's a true purple. 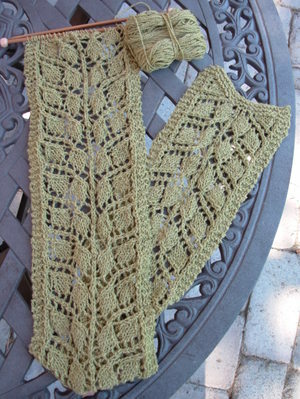 Anyway, I've decided on this pattern from Interweave Knits, Spring 2006. It's called the Trellis Scarf and it looks just complicated enough for me. I will be taking this project on the next big trip! Thank you again, SP! Lastly, I'm finally motivated to finish this Branching Out Scarf, from Knitty. 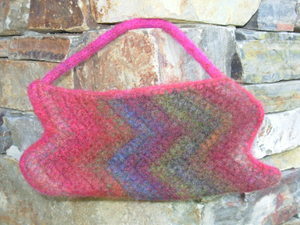 It's made with Silky Wool and it's a nice pattern, but I set it aside for quite a while. Now I'd like to finish it by Saturday so I can enter it in the fair. I've got less than 10 repeats, so I think it's doable. Stay tuned for a fair posting on Saturday! One Skein SP- Thank You! I got a little package in the mail that I had forgotten would be coming, so it was a very pleasant surprise! Thank you so much to my One Skein Secret Pal. It's a beautiful skein of Artyarns Supermerino sock weight yarn in the June Project Spectrum color of blue! There's also a bit of green in it, though the photo is not showing the true colors of this gorgeous skein. 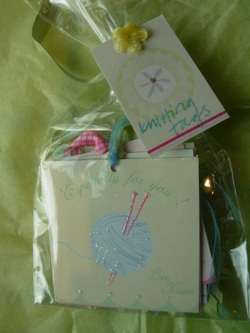 Look how the card even matches and inside is a list of reasons why she picked this skein for me. How incredibly thoughtful! You don't know how much I needed a little pick me up today and how much it meant to get that in the mail. I'm not sure what I'll make yet, but whatever I make it will be beautiful. Well, it's been a busy week and I meant to post sooner, but whenever I had the time to take photos it's been too dark and what's a blog without photos? So, I have a lot to catch up on. 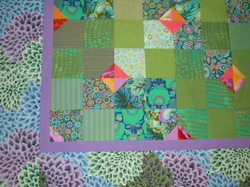 The Moody Greens quilt is coming along. I'm hand quilting now. Here you can see it with borders and a bit of the simple line quilting I'm doing. 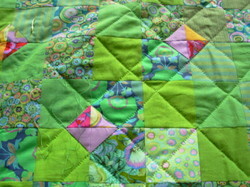 The outside border fabric was one I really admired on a sample quilt at the Stitchin' Post. They didn't have it in stock so I ended up ordering it for the border, backing and binding. I just love those huge dahlias. The Project Spectrum socks continue apace and are my take along project because the stockinette is great for short bursts of knitting. 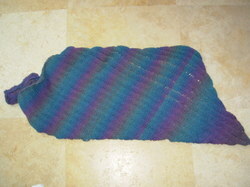 Meanwhile, I got a lot of knitting done on the Karaoke Clapotis while on my trip. Here's a funny little cautionary tale about the socks. Last time I showed a photo of them, I took the photo outside on a rock. The lighting was better outside and I thought they looked really nice reclining there. Well, the next time I got to knit on them was the next day at the airport. So, I pull them out and begin knitting and notice the needles are all rough like they had been scratched up. I could barely move the stitches around. Upon closer inspection I realized that it was pine sap! It must have gotten on the needles during the photo shoot. The saving grace was that the yarn does not seem to have any sap on it at all! Of course, I was in the airport with no rubbing alcohol to remove the sap. I was really bummed that I couldn't work on the socks, but my careful foresight in packing a second project saved the day! I knitted on Clapotis for the whole travel time to San Jose (which was about 5 hours, even from Central Oregon because we had to fly through Portland). I was never more happy to have made sure I had multiple projects. From now on I will always be sure to have several things when traveling, because you never know when you'll hit a snag with your knitting. So, anyway, Chloe and had a great time on the trip. We got to spend time with friends and I had a great time perusing yarn! I went to Yarn Dogs and Knitting Arts, but never made it up to Uncommon Threads (which would have been a good half hour drive) because I needed to get back to the hotel to get ready for dinner. At Yarn Dogs I only bought some extra size 1 Addis so I could work on the socks again, but at Knitting Arts I had a field day. 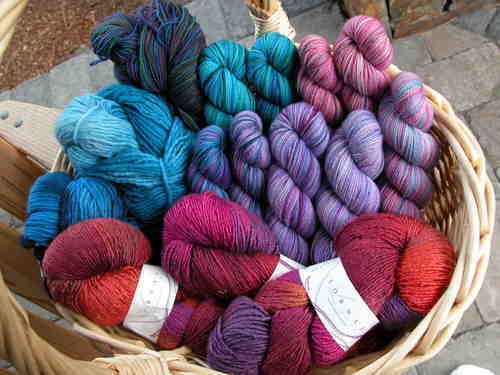 They had just about all the Lorna's Laces lines, some I had never seen before, Malabrigo which I had not seen for sale before and a great selection of Koigu. Here are the spoils of the day. From the left we have two different blue colorways of Malabrigo (one is for my One Skein Secret Pal), Cherry Tree Hill Sock yarn, two pairs of Koigu for socks, the set of five Koigu for Charlotte's Web and Lorna's Laces Lion and Lamb for another Clapotis! I really debated the Lion and Lamb, and at first I thought they had only two skeins. When they found more in the back I had to get it. It's the Irving Park colorway. Well, then I had to figure out how to get it all home. Chloe and I divided it between the suitcases, but if anyone had opened my suitcase at the airport it would have been an explosion of soft, yummy color! I received two packages in the mail this week that made me very happy. One was the next installment of the Socks that Rock Sock Club. 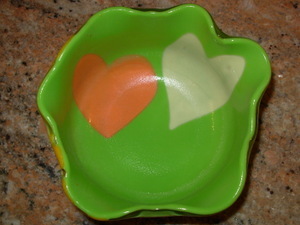 This new colorway, called Fairgrounds is really spring-like and beautiful. I couldn't help taking a photo on the swift because it reminded me of a carousel. The new sock pattern is called Rock and Weave and features a linen stitch cuff that you knit sideways, then pick up stitches along the bottom and knit the sock down. I really like the pattern. Finally, I got a beautiful little package today from Mo at Lemon Gardinia. She has an online store called Froy & Ollo Design and she makes the most beautiful paper products. 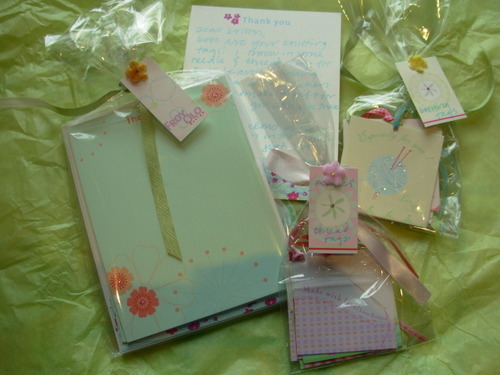 She sent me a package of thank you notes, some knitting tags and some needle and thread tags and a handwritten note! Thank you so much Mo! These were actually a prize that I got from the Secret Pal 7 best pal contest. I have to say a huge Thank You to my SP Spoilee, Yvonne for nominating me. I really had fun with it and it was my pleasure to be her SP. Aren't they beautiful! 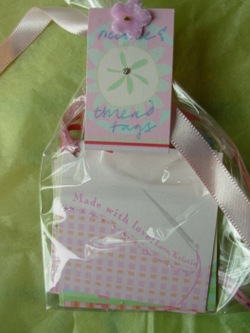 Please go and check out her shop to see the other wonderul cards and gift tags. The birthday invitations are just adorable. Thank you again, Mo! Have a great weekend and if you are in the states, I hope your Memorial Day weekend is warmer than ours will be! We are expecting temperatures in the 50's or 60's with rain and possibly hail. That's the high desert for you! The mountains will be getting even more snow. I keep forgetting to post about this miniswap that Chloe, Ryan and I did. 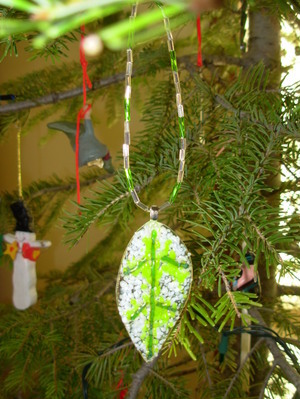 It was organized by Mollycoddle and involved sending a package with homemade, hand-me-down and crafty goodies to another family with children. We got paired with Jane and her two adorable children, India and Griffin. We sent them a couple of hand made tote bags with all sorts of stuff inside and we got in return a fabulous package with wonderful things that the kids love! There were many items that seemed to come from Chinese New Year- lovely papers, the orange lantern, the little red money envelopes, plus some other little novelty items. Here you can see Chloe and Ryan with the items they chose. 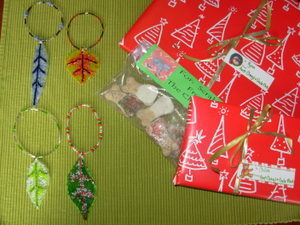 Many heartfelt thanks to Jane, India and Griffin for doing this fun swap with us!